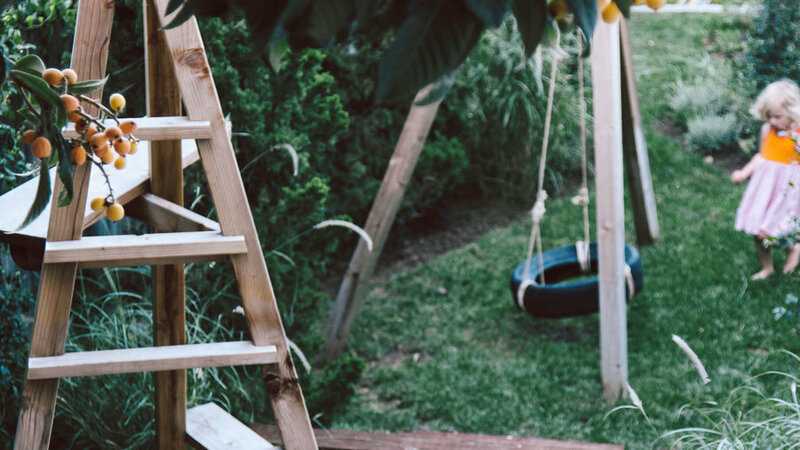 East Coast native, Sari Lehrer had a clear idea of what a backyard should be: “a flat expanse of lawn.” But when she and her husband, Eli, moved from Manhattan to Los Angeles, their new home challenged that notion. Instead of soft green grass, the yard featured steep slopes and concrete drop-offs—all the more unsettling because the couple had a 20-month-old daughter and another baby on the way. “You haven’t known fear until you’ve watched a toddler try to navigate concrete steps without a handrail,” Sari remembers. 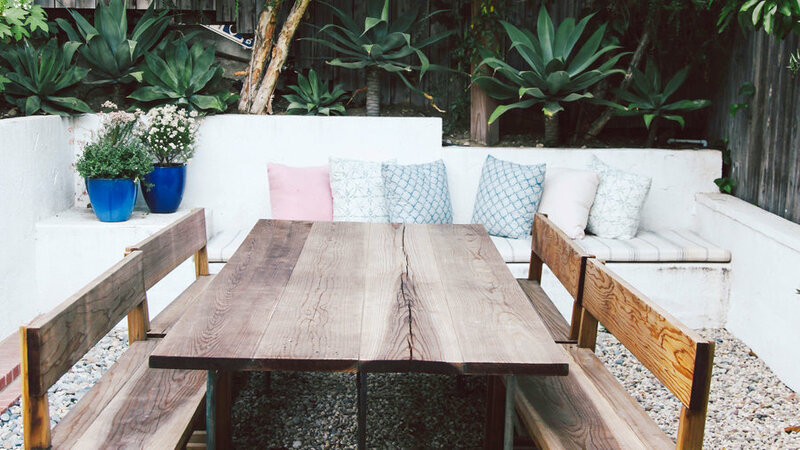 A dining table gives grown-ups a place to kick back. 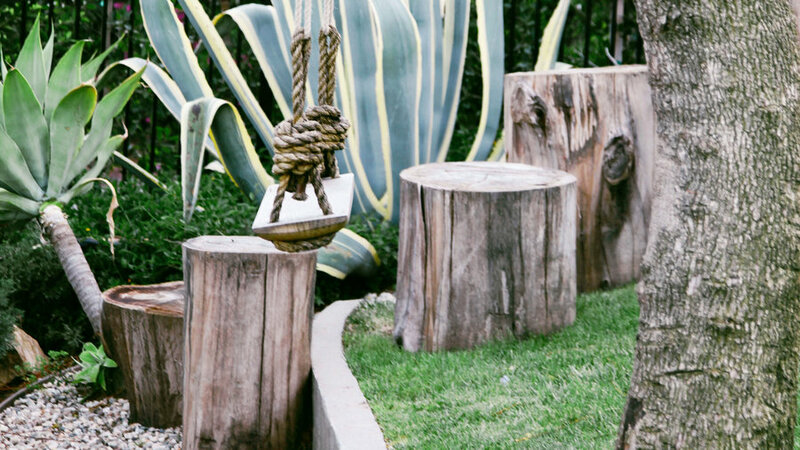 Spineless Agave attenuata keeps things green with little main­tenance. 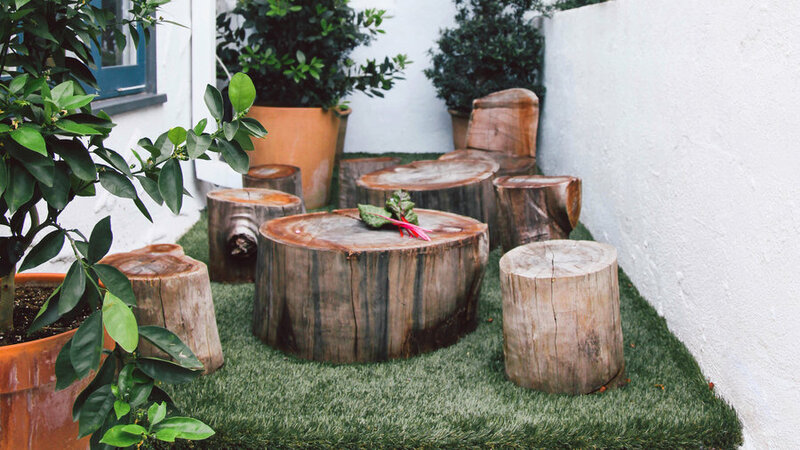 Gore loves tree trunks for children’s outdoor spaces, both because they’re a natural repurposed material and because “they can be rearranged endlessly,” she says. In the front yard, the Lehrer kids use them as oversize steppingstones. One of the two wooden structures is used as a ladder, jumping platform, and lookout tower, while the other supports a tire swing. 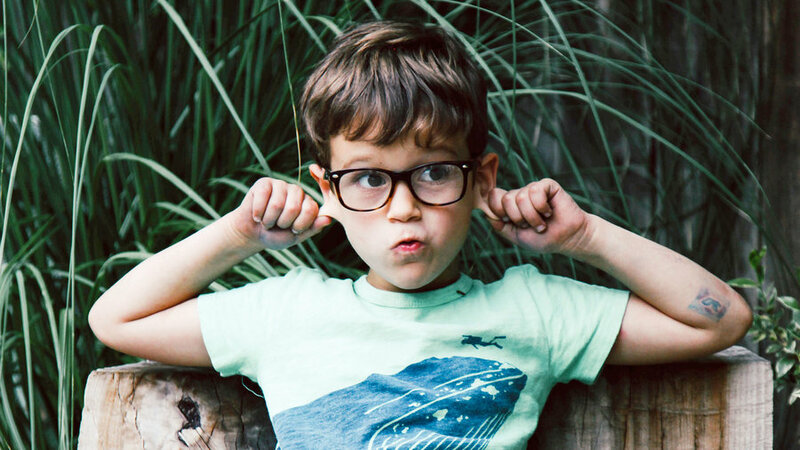 “The play spaces let the kids feel like they’re off doing wild, illicit things, but they’re not actually in danger ... so I’m not having a heart attack,” said Lehrer. 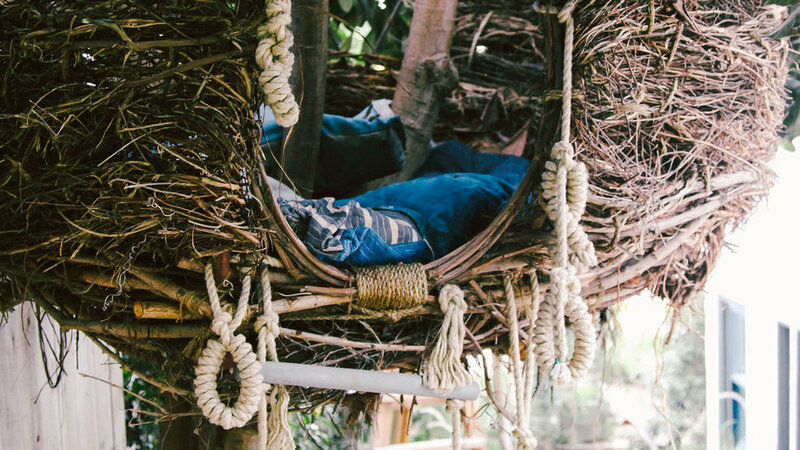 Suspended from a loquat tree in the backyard, a grape and honeysuckle vine nest, made by artists Didi Beck and Dylan Hostetter, serves as a hideout, complete with cushions and peepholes. 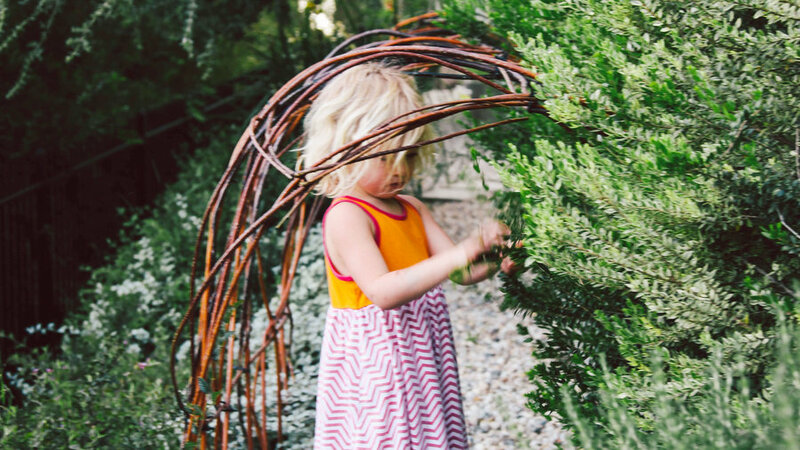 “For the kids, it’s pure magic,” says Sari. 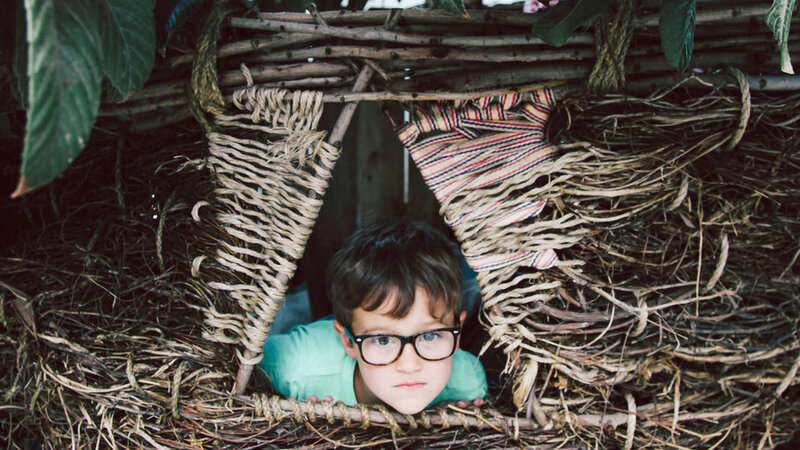 “They feel like they’re floating in midair.” She anticipates the nest will become a solo refuge for the children as they get older and start seeking more alone time.